Like many of you, I've been searching for something to grasp on to for just a glimmer of hope for Saturday. A rogue stat or personnel matchup. But in the reality that we all live in, it just doesn't seem to be anything there. Sure, you can look back on past teams that have defied the odds and beaten the Buckeyes. The 1969 team, sure. Maybe 1995, 1996? 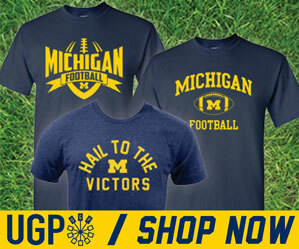 But it hard to really draw a lot of comparisons between those teams and Team 134, though. The truth is, Ohio State is a 14+ point favorite for a reason. And if you want to let history be your guide, just have a look at this chart that I busted out after last year's 26-21 loss in Columbus. 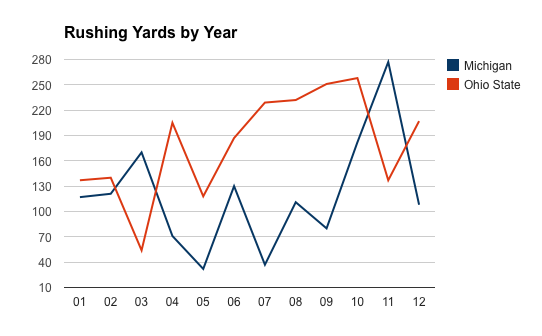 The two years Michigan gained more yards rushing, 2003 and 2011...both wins. The rest of the years? Not so much. It's very simple: Run the ball effectively, and control the game. Control the game, and you win. This is a formula Ohio State has figured and they've worked it to their benefit. Ohio State averages 314.7 yards rushing per game...6th nationally. Michigan averages just 128.8...100th in the nation. Coincidentally, Ohio State boast the 6th ranked rushing defense giving up just an average of 95.3 yards on the ground. Michigan's rush defense, while still impressive, allows 116.4. Not exactly what Wolverine fans want to hear. Carlos Hyde has 1,064 yards rushing this season on 138 carries...which is an average of 7.71 yards per carry. Even more impressive, he only have 2 rushing yards lost. TWO! That speaks volumes about Ohio State's senior-laden offensive line. By comparison, between Fitz, Gardner, Smith and Green, Michigan has amassed 449 rushing yards lost this season...300 of which are Old 98's. Hard to win with that. Make no mistake, I'm a proponent of believing that anything can happen. Any Michigan fan who can recall the 90's and beyond will tell you that record books don't matter in this game. The 2008-10 years defied that notion...but I'd like to think that it's still there. Can Michigan win without running the ball more than the Buckeyes? Sure. If the Gardner-Gallon-Funchess show is in full-stride, it's possible. But you can't bank on that. Run it to win it. It's how The Game is won.